ThinkTQ - Welcome to Learn & Burn! Home > Welcome to Learn & Burn! Welcome to Learn & Burn! You have just joined the ranks of the most successful people in the world. You will receive a Welcome eMail to the address you provided. Please make sure ThinkTQ.com is in your address book, and on your approved sender list. If you do not receive it in the next few minutes, check your bulk/spam folder and mark our eMail approved/not junk... as our systems are designed to change the very fabric of your future. Instructions for best use of your Success Essentials program. Be sure to review the 7 Simple Steps to Better Health and Fitness and Greater Personal Productivity. Five minutes invested printing and reading this page will give you a big jump start towards the life of your dreams! Installer Notes / Errata / Where is Missing Track 9? If you did not see the installer notes, Right Click image for the full PDF. 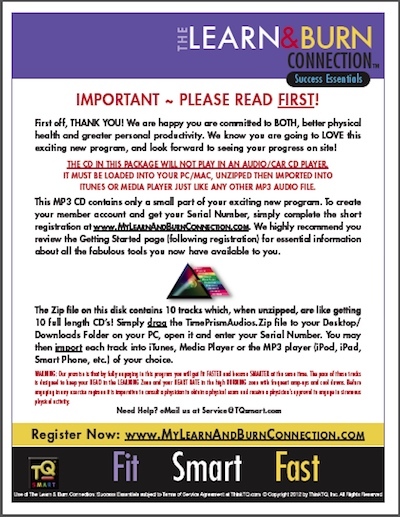 Your CD contains an MP3 ZIP FILE that will NOT play in your audio/car player. It is designed to be imported into iTunes/Media Player, then played from there on your iPhone, Pod, Smart Phone or any other MP3 player. After all, how else could we get 12 CD's on a SINGLE disk?! In our zeal to master the original, we ADDED your two bonus CDs to the Zip file, but unintentionally (yes smart people sometimes make stupid mistakes!) LEFT OUT CD 9 out of 10 -- your Optimize/Time Management Color. 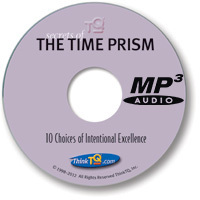 Sorry for the confusion... but the good news is that you do NOT have to download the Achieve Success On Purpose or the Secrets of the Time Prism audio files -- which are MUCH larger! Because there are so many different WINDOWS versions with all kinds of different settings, we have found 2 common, but simple to fix issues. 1. WIN gets "confused" and does not recognize the ZIP file. Depending on your settings, a ZIP file should automatically un-stuff itself. If it doesn't, simply drag the zip file to your downloads folder, double click and you will see a folder with all your MP3 audios. 2. The files will not automatically load into WIN iTunes. This is because you turned off the feature, or upgraded and it was set to off. From iTunes: 1) Select EDIT 2) Select PREFERENCES 3) Select ADVANCED. Make sure to check mark the box that copies the file to your library. This program is part of the comprehensive TQ Smart family of high-performance, low-cost training products. Now that you are a member of this exclusive club, you have acess to people, systems, tools and technology to take your success up to the next level, and beyond. 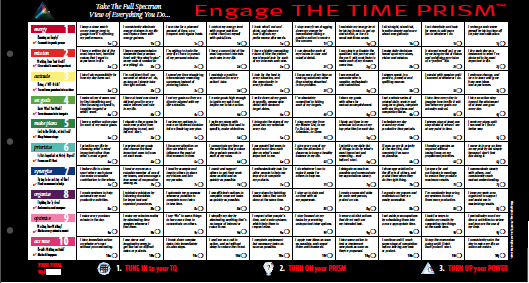 To fast-track your success track, please follow this short Getting Started outline. It will answer most of your questions before you even know to ask them! The long and short of TQ is that we are the world's leading publisher of virtual training products for personal and professional excellence — the only company with a MEASURABLE, SEQUENTIAL, SYSTEMATIC PROCESS to guarantee that you will achieve ALL your hopes and dreams. Yes, you can do it the good old fashioned "American Way" and simply jump in somewhere, but if you do, we recommend you BOOKMARK THIS PAGE! Learning While Burning is all about encouragement... lots of information presented in a fun new exercise environment... and that, "Why didn't I think of THAT before" whack on the side of the head we all need from time to time. The coaching style is a bit different from what you might expect. It is not a nasty Drill Sargent yelling and screaming at you... it is not your Personal Trainer egging you on... it is not an over-the-top, over-hyped motivational "Tony Robbins" walk on fire cheerleader style. It is however, an understandable, articulate, voice of success vying for a bit of your attention... instructing you... educating you... giving you something to think about... very much the Considerate Coach who is mentoring you as you pump up your exercise routine. In designing this fresh, new approach to learning while you are burning, we decided against and overly "pushy" or "confrontational" style used by many to get people's attention and shove them into action. Some will love our approach. Some will hate it. All will benefit from it as you step out of your comfort zone. Remember, life begins at the end of your comfort zone! Listen to all 10 Color Tracks from 1 to 10 all in a row. Your muscles will love the music and your brain will love the ideas. These tracks are structured where we explain the key Factors of success, and give you 3 big memory hooks to help you learn, remember and master these ideas: Power Up Questions... Integrating Questions... and Insight Questions — questions designed to get you thinking way out side the box... and even further outside your "comfort zone." As you listen and learn, be sure to go to our TQ Smart sister site, TheLearnAndBurnConnection.com, to post your progress, share your Learn & Burn Experiences with others, post a Youtube video, etc. There you will find blogs, articles, and real world ideas that will help you lead a HEALTHIER life style, while becoming a lot more effective, productive and successful! Once you have a fair understanding of what you THINK this revolutionary new program is all about, we will SURPRISE you. What you think you know about your success potential, vs what you actually do each day is the subject of your FIRST TQ TEST. Of course, you may take this Quick Test anytime, then move on to the Gold Standard Test of performance Excellence: Your Actual TQ Test. After you receive your Test Results, you will be given a Color Chart that will show you exactly where you are hot and where you're not. This will then guide the rest of your Learning and Burning experience. 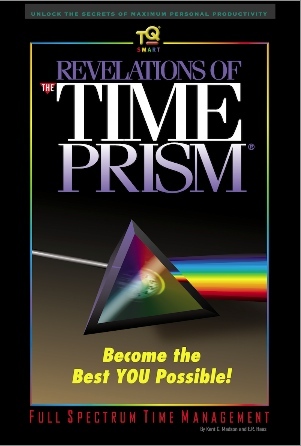 Be sure to download and read Revelations of The Time Prism by the time you have listened to Color 4: Setting Goals. If you are wanting to achieve far greater success, in far less time, this "primer" will put all of this exciting new program into clear perspective. And last, but not least, be sure to listen to both the Secrets of The Time Prism and Achieving Success On Purpose audio tracks. 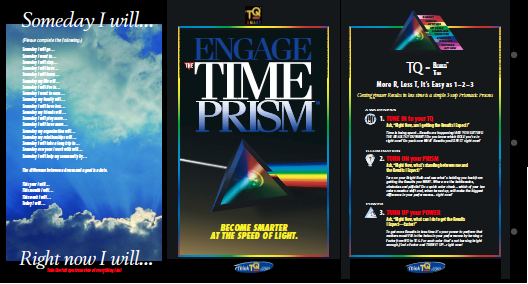 Do not listen to these while exercising, as they are full TQ training sessions designed to get you to better understand the connection between your purpose in life, your performance and how your 10 Colors are currently driving your successes and failures. You will want to download and print this important form before getting started. It is a road map to your future success. As you are listening to The Secrets of The Time Prism audio, you will be asked to take the broad view of your success potential. This is the low-tech approach to constantly staying committed to your dreams and connected to your performance. On side 1, you have all your Someday Dreams written out and in front of you... on side 2 you have a snapshot of your current power to achieve the Results you desire. This form is NOT a replacement for taking your Actual TQ Test, but is a form you can carry with you, take out often, and see how much progress you are actually making on improving each of your 10 Colors. Why not start each morning with a fresh new look at the Factors driving your success. Choose a Color to review, then Learn and Burn! As you will soon discover, it is the intensity of each of the 10 Colors of Prismatic Performance that determines if you will live your DREAMS and achieve all your GOALS... or NOT. computer and open from there. The first 5 minutes of each Workout Session is a general overview of the importance and impact of a specific Color to your overall success. This is followed by a list of 10 different actions (we call Factors of Success) you can take to improve this one area of your performance. Then, there is a rapid fire list of questions and short bursts of advice — all purposely designed to implant and integrate these powerful ideas into your life. The process of improving time management and personal skills is the same as improving physical fitness. Every time you exercise, you get a little more fit. However, you only gain strength and endurance by repeating the same exercise over and over again. The same is true with taking new ideas and growing positive habits. They must be remembered and then practiced, time after time, before they become truly mastered. All 10 Workout Sessions have been purposely recorded with up-beat, high intensity music in the forefront and the words of advice in the background so that you can enjoy listening to them over and over again. As you exercise, your daily performance will improve as a result of the success ideas you hear regardless if it occurs consciously, subconsciously or even unconsciously! Any one idea might stand out for you as the one that will transform your life. It is equally probable that the total immersion in the conversation about one Color throughout an entire workout will cause you to take much more positive actions at random related moments later in your day. Each time you pick up the pace and hear one of these great ideas you will nurture and strengthen both your body and mind. Your energy level will increase and you will start to put more of these highly productive ideas to work as you gain the physical strength and the "working smarts" to achieve greater success in your life. Scientific Principle #1: Spaced Repetition cures the 90% Memory Deficit Disorder. Because out-of-sight is out-of-mind, "forgetting to remember" is a huge drain on your performance. Every TQ product is designed to help you effectively learn, remember and master the skills necessary to produce outstanding results. Our emphasis is on helping you remember to take smarter actions, a great deal more frequently. Cure the 90% Memory Deficit and your performance will soar. Through Learn and Burn Spaced Repetition, instant testing and access to our full library of Ideas for Action — we never let you FORGET that your performance matters — or how to improve it. Your Forgetting Curve is a big cause of failure! Psychologists have been interested in learning and forgetting since the early days of the discipline. The researcher who pioneered the field, Hermann Ebbinghaus (1850-1909), created a way to assess "pure" learning — that is, learning free of meaning — and the rate at which people forget. He found the rate to be highly predictable, and completely dependent upon repetition and reinforcement. 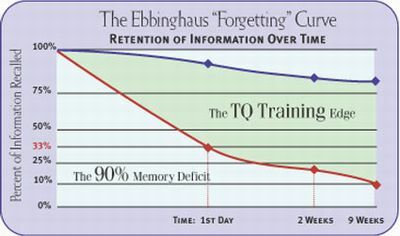 Psychologists now call this the "forgetting" curve, and developed "spaced repetition" learning techniques to combat it. To this day, Ebbinghaus' work has stood the test of time. Ebbinghaus discovered that when we acquire a new idea, much of our forgetting occurs right away. A SIGNIFICANT amount of information is forgotten within twenty minutes of learning it; OVER HALF OF THE MATERIAL LEARNED IS FORGOTTEN WITHIN AN HOUR. Although we forget almost two thirds of what we learn within a day, retention does not decline much beyond that point. In other words, if information is retained for a day, the knowledge is there to stay. The blue curve (top) shows that after JUST ONE REVIEW, you can expect to recall about two thirds of new information for several weeks -- even more if it is "meaningful" and related to what you are doing. With multiple reviews, recall is permanent. The red curve shows how much you can expect to FORGET without review. Numerous experiments and studies have shown that, typically, YOU WILL FORGET ABOUT 80% OF NEW MATERIAL IN 2 WEEKS -- if you do not review or incorporate those ideas into your daily activities. Be SMART — incorporate what you learn into your daily actions... and you will THRIVE! The Message is Simple. Reinforce to Remember. It doesn't matter if you have a Harvard MBA or a degree from the school of Hard Knocks — continuing education is not optional. It's a REQUIREMENT for success in this results-driven economy. Learn and Burn Success Essentials makes this SIMPLE SIMPLE SIMPLE. Power up your ear buds... and let the Voice of Success between your ears do his work! How does Learn & Burn: Success Essentials really work? In a way, Learning and Burning is a "do it TO you" product! You listen... you learn... WHILE you burn — getting FIT SMART FAST. The truth is, your brain makes up only 2 1/2% of your body mass BUT consumes over 25% of the Oxygen you breathe! It is a proven scientific fact that when you are exercising, you are flooding your brain with more Oxygen... which causes you to learn more faster and retain information longer. 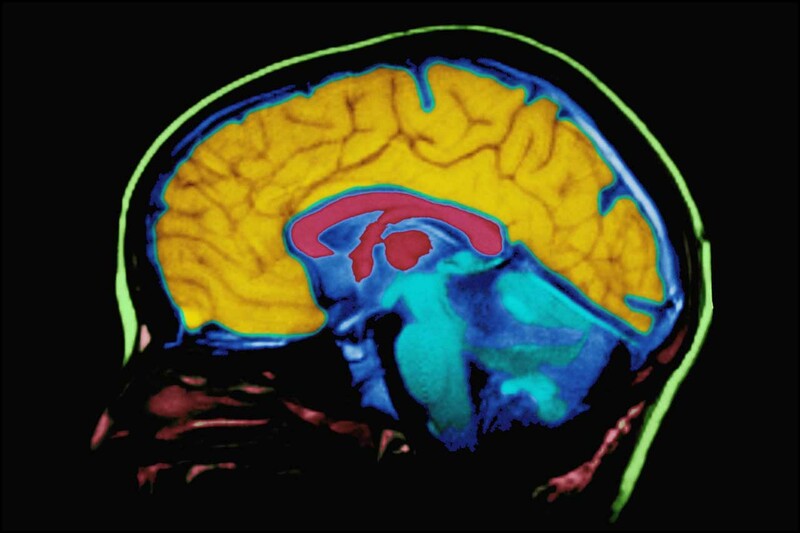 With more O2 to the brain, you are actually improving information flow and retention. We could give you a long winded explanation about synapse formation, and how regular physical activity helps improve oxygenation of the brain, which is vital for synaptic formation and growth — but, thankfully, we won't! Your Brain While Learning and Burning! Fit ~ Smart ~ Fast! * WARNING: Before engaging in any exercise regimen it is imperative to consult a physician to obtain a physical exam and receive a physicians approval to engage in strenuous physical activity. You now have access to various membership enabled areas of ThinkTQ.com, publishers of The Power of TQ and 10 Choices of Intentional Excellence, Today's TQ, The Complete Power of TQ System, and our best-selling program, Success On Purpose. These exclusive programs will help you discover and release your full potential... giving you a powerful edge in everything you do. To get maximum value from our site, we highly recommend that you learn more About TQ, and that you browse through our My TQ and Training Tools sections. Here you will find a treasure trove of information and training resources critical to your success, your career, and your life. Important information regarding your ThinkTQ.com account has been sent to the email address provided during registration. IMPORTANT: Some ISPs block email from unknown sources. If you don't see the notice soon check your spam or junk mail directory to see if it has been misfiled. Your ThinkTQ.com membership also includes a free subscription to Today's TQ, our Daily Lessons in Intentional Excellence training program. These daily emails will serve as reminders for you to stay committed to your dreams — and connected to your performance. We have hundreds of thousands of customers who find that Today's TQ is the most motivational, inspirational, educational and transformational training program they have ever encountered. We think you will agree. If not, you can cancel your Today's TQ subscription at any time, for any reason. IMPORTANT: To ensure that you receive the Today's TQ training system, you should add TodaysTQ@ThinkTQ.com and Service@thinkTQ.com to your e-mail system's contacts or "friends" list. Because every area of this site depends upon your knowing your Time Quotient (TQ), we strongly recommend that you invest two minutes to take your Quick TQ test. Using the world's first Time Prism®, you will see which areas of your performance are weak... which are strong... and specifically what you must do differently to achieve greater results. Just as a prism separates light into its component colors, our Quick TQ Test separates the blur of your life into 10 color-coded bands of light — each critical to achieving the results you want. In just two minutes you will see deep into the heart of your performance — looking for specific areas that are strong and vibrant — and areas where you may need immediate improvement. If you want to expand your career from the mundane to one that is truly exciting ... to a career that is both emotionally and financially rewarding ... this is the 'MUST-READ' book of the decade!